Two years ago New York had a huge Halloween snow storm. 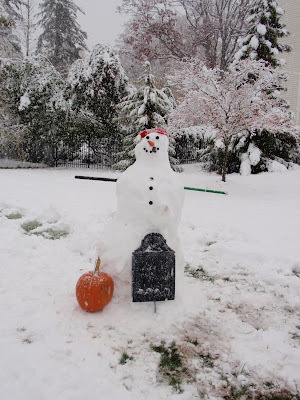 in our area by Super Storm Sandy. This year is looking good! It's overcast and damp this morning, but it's supposed to be in the low 60's this evening. Martina of Northern Nesting shared a very special gift received from a friend of the family. You must stop by to read the story behind this gorgeous china. Victoria's Vintage Designs transformed an old dresser into this beauty. 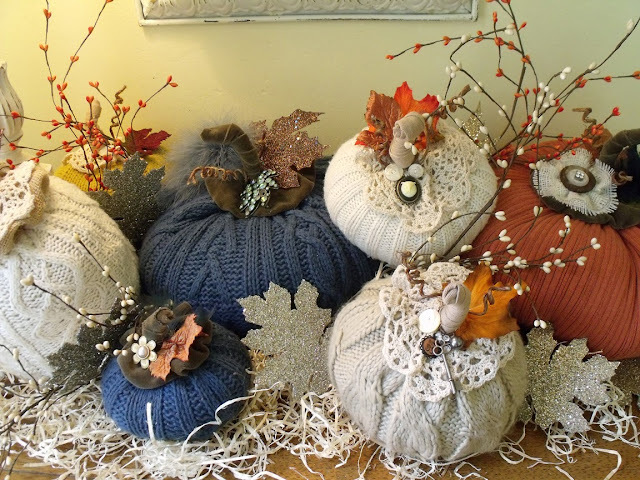 Mod Vintage Life gives a wonderful tutorial on how to create these beautiful sweater pumpkins. 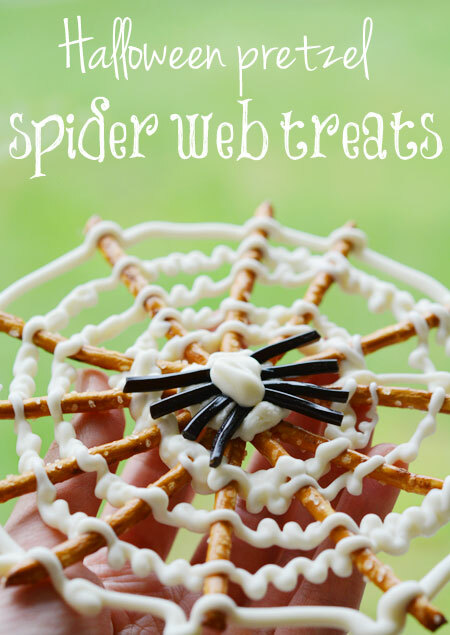 One Little Project gives a great tutorial on how to create this Halloween pretzel spider web treat. Don't forget I have a giveaway going on right now. Just click here to enter for a chance to win a $25 Target gift card. Thank you so much for joining in my Fall into Fall party last week. dining room all decked out for fall. 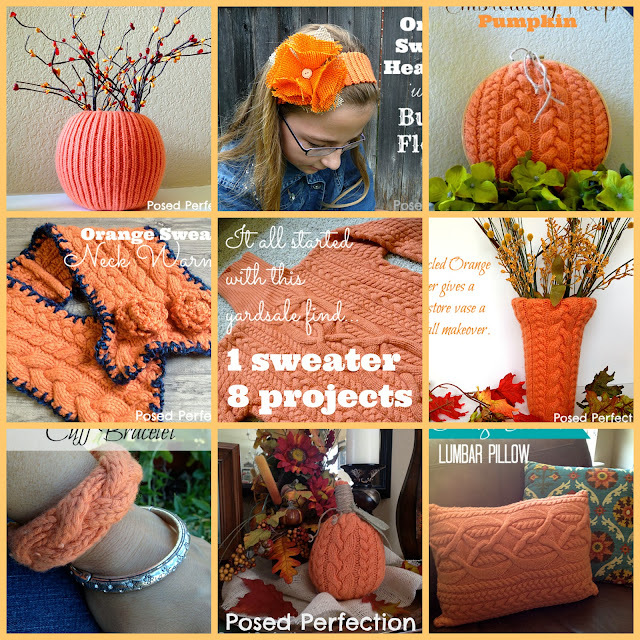 Over 95 of you checked out Posed Perfection to check out how she made eight different projects out of one sweater. 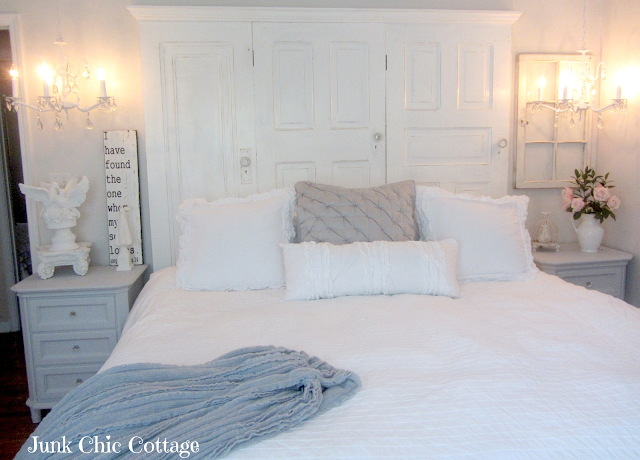 Over 90 of you visited Junk Chic Cottage to check out her newly updated master bedroom. Also, don't forget to come and enter for your chance to win a $25 Target gift card! Can't wait to see you all tonight. The party starts at 8pm EST. See you then. Don't you love weddings? A great love story never goes out of style. There are so many fun things surrounding a wedding...the engagement, the bridal shower, the rehearsal dinner, the wedding. One of my favorite parts of a wedding is the bridal shower. The bridal shower is such a special part of the wedding planning. It's so nice for a bride to be surrounded by her family and friends to help her celebrate her upcoming wedding. I still remember my bridal shower like it was yesterday. It's a very special day in a girl's life. In planning a bridal shower, Target makes it super easy. Target has a wedding theme of "Be Yourself, Together". This represents two unique people joining together while still celebrating their originality. If I were planning a bridal shower today, I would go to Target for everything I would need. I would plan an intimate bridal shower. It is so special to share your bridal shower with some close friends and family. The table would be set using Target's Threshold Wellsbridge Dinnerware Set in aqua, one of my favorite colors. I would set the table using crisp white Threshold dinner napkins, Oneida Metra silverware and Libbey Merlot wine glasses. I would use the Threshold stoneware cannister as bud vases and have the table filled with little arrangements. After the party I would give the bride all of the dishes, flatware, napkins and glasses, to use during her marriage forever. For dessert, instead of a cake, I would bake individual cupcakes. I would display them on the Tiered Pedestal Serving plates (that come in a set of three). I would also use the Cake Stand with Cover to display more of the cupcakes. As my gift to the bride, I would buy her the KitchenAid Ultra Power Stand Mixer. I use mine all the time and it's the gift that will keep on giving. I know you love Target as much as I do. 1. Visit the Target Wedding Catalog then come back here and leave a comment telling me which product you would use or gift and a bridal shower. It's that simple. 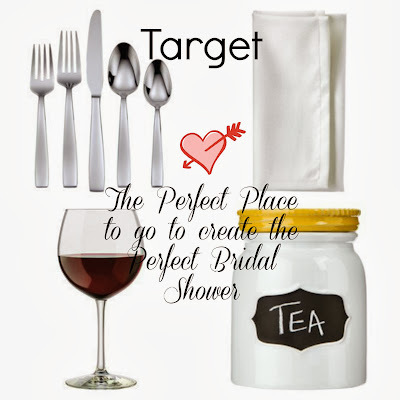 If you're planning a wedding, be sure to register at the Target Wedding Registry - you'll be happy you did! Feel free to follow along with the Wedding fun by following #TargetWedding on Twitter, Instagram and Pinterest!! The giveaway will close on Monday November 4 at 11:59pm EST. You must leave a separate comment for each entry in order to maximize your chances to win. Must be 18 years or older. Open only to residents in the 48 lower states. If your email address is not linked to your Google account, please make sure to include your email in your comment so you can be contacted in the case you win. While I was provided with a gift card from Target, the opinions expressed are entirely my own. I'd like to welcome Amber Hash who has written an article especially for DIYbyDesign. Every futuristic movie, television program or book has described flying cars, robotic housekeepers and unusual kitchens and bathrooms in which the obvious features are hidden away, tucked into invisible recesses or so fundamentally changed that they no longer look like a toilet, basin or bath. While flying cars and jet packs do technically exist, they are far too expensive or unsafe for public usage, and robotics, while making tremendous advances year on year, have still not come up with one that combines the perfect home companion and domestic servant in one, but modern design, technology and materials have advanced enough to allow us to indulge in our dream sci-fi bathroom! The 2014 trend for bathroom décor is to invest in bathroom fittings that look different; not just to other bathrooms, but to any bathroom! This wonderful hammock design bath positively invites use, promising a smooth comfortable cradle while you soak in steaming, fragrance water. 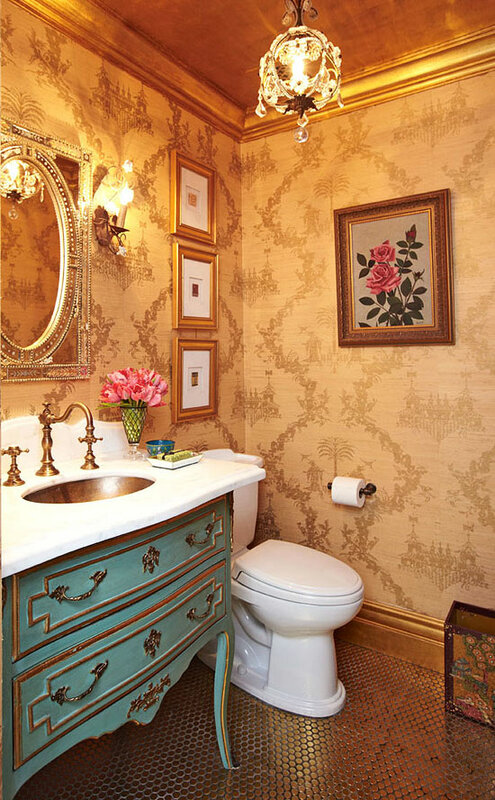 This bathroom is similar, offering the same soft and round contours, while having the bath more firmly on the ground but still unique and distinctive enough for any discerning fashionista. While the bathroom feature here has a clearly recognizable toilet (which will be a relief to any guests in urgent need of relief!) the bath itself is splendidly reminiscent of an eternity pool, speaking of relaxing, candlelit pampering sessions after busy days at work. 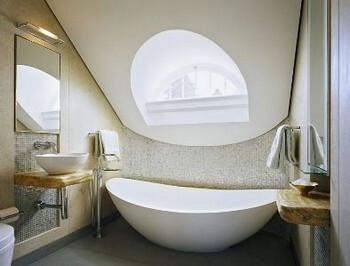 Many modern architects and interior designers are choosing to strip out barriers and walls inside bathrooms, creating one generously large wet room. These bathrooms are not only attractive and spacious, they are perfect for people who have poor mobility or even rely on a wheelchair to get around. 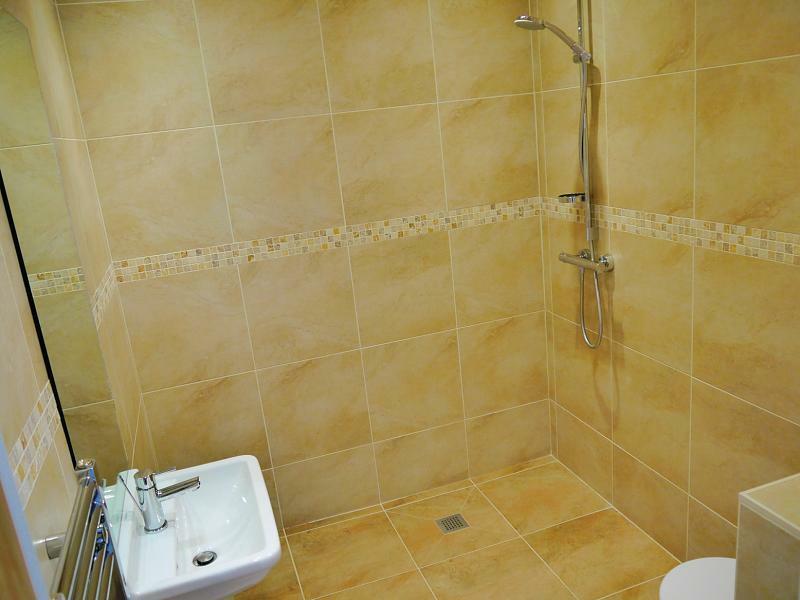 As you can see, having a wet room rather than a traditional bath can really open out a bathroom, making even the smallest space seem larger. 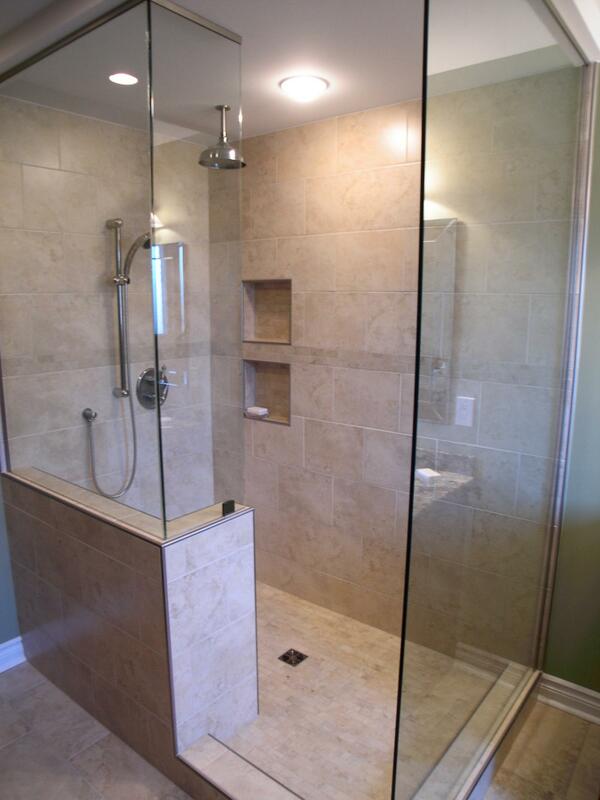 If it is necessary to have a wall or barricade of some kind in the bathroom, perhaps opt for clear glass. This allows the full dimensions of the room to be displayed to the best effect, while containing water, steam and warmth into a small area. The environment is a popular theme for many and for most of us switching to eco-efficient systems and materials is an easy matter when redecorating or renovating. Choose bathroom fittings that use as little water and power as possible, while still providing a good bathing experience. Solar heaters can be used to make sure that you always have enough hot water for the whole family to bath, without it costing you a penny on your electricity bill! For small bathrooms you can install heated towel rails from My-bathrooms.co.uk as they provide good quality bathroom products at very affordable prices. So bathrooms in 2014 are going to be energy efficient, spacious and futuristic-looking, but what color themes are going to be popular? The answer is, any color you like! Add a few metallic touches to add a warm touch and try to stay to a scheme that uses no more than three colors (more than three can create a muddled look, especially in a room that is traditionally small). Your bathroom is going to be used several times a day, every day for years so make sure that it is one that you will enjoy going into each day!